At the 2018 World Junior Championships, Alex Krasnozhon was in the lead after the short program, poised to take the title. Then disaster struck on the first jump of his free skate: He injured his ankle and withdrew from the competition. After months of rehab on his ankle and a solid season on the senior level—including a fifth place finish at the 2019 U.S. Championships—Krasnozhon returns to Junior Worlds with a fresh perspective, and goals of putting a quad back into his long program. He says they will assess whether to include the quad after the short program. This will be his last competition at the junior level, and he says that he is looking forward to competing at Junior Worlds one more time. Before leaving for the competition in Zagreb, Croatia, Krasnozhon chatted with Figure Skaters Online for a brief question and answer session. Read the Q&A on Figure Skaters Online! Categories: 2018-2019 Season, competitions, Figure Skaters Online, interviews | Tags: 2019 World Juniors, Alex Krasnozhon, World Junior Championships, World Junior Figure Skating Championships | Permalink. Ting Cui is going to have a busy second half of the season. She’ll be competing at the Four Continents Championships and attending U.S. Figure Skating’s 2019 World Junior Team Camp, plus she’s the first alternate for the senior World Championships team. Such an outcome seemed all but impossible on Thursday, Jan.24, when she fell twice and failed to complete a combination in the women’s short program at the U.S. Championships. She was in 12th place heading into the long program. But she climbed up to fifth place with a near-flawless free skate that earned a standing ovation from the crowd at the Little Caesar’s Arena in Detroit. 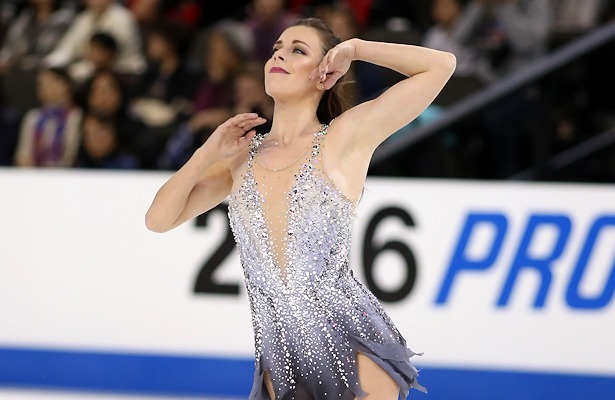 Read the rest of the story—including how this performance will help her throughout the rest of the season and her connection to 2006 World Champion Kimmie Meissner—on Figure Skater’s Online! My Figure Skaters Online coverage of the ladies event at the 2019 U.S. Championships, including Alysa Liu’s historic triple axels! Our “Motor City Moments” round up of mixed zone interviews. Categories: 2018-19 Season, 2019 U.S. Nationals, competitions, Figure Skaters Online, interviews, U.S. Nationals | Tags: Kimmie Meissner, Ting Cui, Ting Cui 2019 U.S. Nationals, Ting Cui and Kimmie Meissner | Permalink. The 2019 U.S. Figure Skating Championships kick off in less than a week, and I’m counting the days until I head to Detroit to cover the event with Figure Skaters Online. Leading up to the event, I called in for Kaitlin Hawayek and Jean-Luc Baker’s media teleconference and wrote a preview piece for ice-dance.com. When American ice dancer Jean-Luc Baker suffered a concussion during preseason training in August, his season with partner Kaitlin Hawayek could easily have gone off the rails. They lost training time and weren’t able to compete before their first Grand Prix event of the season, NHK Trophy in Japan in November. But instead, after a careful recovery, the team went on to have a breakout season on the Grand Prix, winning gold at NHK and qualifying for their first Grand Prix Final. “Once we were able to start training again, it was training as quick as possible to get ready for NHK, then we had [Internationeaux de] France a week later, and the next thing you know, we made the Final,” Baker said. For more on their year of firsts and the team’s goals heading into Nationals, read the full article on ice-dance.com! Categories: 2018-19 Season, 2019 U.S. Nationals, Grand Prix, interviews, other blogs, U.S. Nationals | Tags: 2019 U.S. Nationals, ice-dance.com, Kaitlin Hawayak and Jean-Luc Baker | Permalink. Honorable mention goes to the closing moments of Rika Kihira’s long program, with it’s beautifully paced choreography. I’m trying to stick with only four favorites, for alliteration and organization, but sometimes I can’t help myself. In the ice dance event, I loved how Team USA’s Kaitlin Hawayek and Jean-Luc Baker enter their stationary lift directly out of the curve lift in the free dance. A difficult setup that shows strength and control, and helps blend the elements seamlessly into the program, rather than telegraphing them. Setting aside that she doubled the jump here, I love this entry, choreographed by Olympic Ice Dance Champion Charlie White. They are doing different movements leading into the jump, but still have perfectly synchronized timing. Plus, this is more visually interesting than simply entering the jump by skating next to each other, as many pairs do. Categories: 2018-19 Season, choreography, competitions, Grand Prix, impressions | Tags: Alexia Paganini, Grand Prix France, Internationaux de France, Jason Brown, Kaitlin Hawayak and Jean-Luc Baker, Rika Kihira, Vanessa James and Morgan Cipres | Permalink. I’m watching the short programs at Rostelecom Cup while I type out this post, as I’m sure many of you skating fans are as well. In the time between the shorts and tomorrow’s long programs, let’s take a brief look back at NHK Trophy last week, for my four favorite costume looks. Admittedly, this is a very U.S.-centric post, but I have to say that the American skaters brought their fashion game to this event! Kaitlin Hawayek’s dresses in both the rhythm dance and the free dance were gorgeous. I especially loved the open back on the red rhythm dance dress (but sadly couldn’t find a good photo of it! ), and the sheer sleeves on the free dance dress. On the men’s side, Alexander Johnson was the clear fashion standout of the group. I loved the color of his short program outfit, and the architecture of the long program top was unique and minimalist. This was his first Grand Prix event, and he prepared for competition this summer while balancing an investment banking internship—major kudos there. Did anyone else have any fashion faves from this event or the rest of the season so far? Categories: 2018-19 Season, competitions, Grand Prix, impressions, skating fashion | Tags: Alexa Scimeca Knierim, Alexander Johnson, Kaitlin Hawayek, Mariah Bell | Permalink. She showcased excellent speed and jump height in this program, as well as a joy for skating that I hope we will see again this weekend, regardless of placement. This happens to be the second Flashback Friday from the 2012 Rostelecom Cup ladies event, which was full of some great performances! Here’s to some more this weekend at 2018 Rostelecom. Categories: 2017-18 Season, 2018-19 Season, Flashback Friday, Grand Prix | Tags: Flashback Friday figure skating, Gracie Gold, Gracie Gold Rostelecom Cup, Grand Prix of Figure Skating | Permalink.